This card comes with a 25.24% variable APR. That’s a little higher than a lot of other business cards. However, this is because applicants aren’t required to have excellent credit scores to apply – an average or fair score is enough to get the Spark® Classic for Business. Who is the Spark® Classic for Business card right for? Any small business owner or sole proprietor who doesn’t have great credit yet could consider applying for this business card as a way to build their credit score and hopefully gain access to cards with greater rewards and a lower APR later. No annual fee also makes the card easier to afford than some other options, useful as those with a lower credit score are also likely to be looking for savings where they can find them. For small businesses different needs, a rundown of other popular business credit cards is available here. Are there introductory rates and rewards? Unfortunately, as a more affordable card designed for those needing to build credit, the Capital One® Spark® Classic for Business does not feature any introductory rates or rewards. What are the cash back terms like? The Spark® Classic offers 1% cash back on all purchases. Although it’s nice to avoid complicated categories and confusing different rates, 1% is not generous compared to many other options. That said, cardholders can receive unlimited cashback, and there’s no minimum amount to redeem. 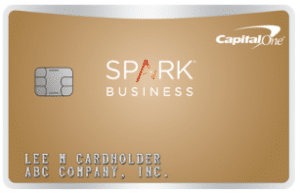 Small businesses able to get a cash back business card with more generous terms due to their higher credit score should consider the Spark Cash for Business from Capital One instead, which offers 2% cash back. The Spark® Classic for Business doesn’t operate a points-based system – only cash back rewards are available. Does the Spark® Classic offer any travel perks or rewards? Travel and emergency assistance services, such as legal or medical referrals, and ticket replacements. This help is available by phone 24 hours a day, year-round. Small businesses interested in generous travel perks with higher credit should consider the Spark® Miles card, also from Capital One®, which features special travel perks and a relatively generous mile earning rate of 2X purchase. What other benefits come with this card?